Dinesh Karthik feels really lucky and grateful for his selection. He believes that his journey for the world cup started 2 years back when he came back to the Indian team in 2017 and was confident that if he does something special, he can secure a spot in the world cup squad. There were some doubts when he was dropped during the home series against Australia, but Karthik said that the communication with the Selectors was very clear about giving equal opportunities to Pant and him. Speaking about MS Dhoni, Karthik said that "Look, as far as MS Dhoni is concerned, I am just that small first-aid kit that will travel with the team. If he gets injured then I will be the band-aid for a day" as reported by Times of India. 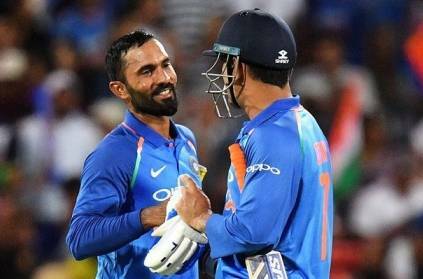 Dinesh Karthik is also confident that he can play the role purely as a batsman at number 4 or as a finisher as he has done previously and will be working on those skills as well. Dinesh Karthik is a very good player and a humble human being and hopefully, he has a great tournament. This page contains news relating to various facts and events. The views are generally about current affiars and general topics in diversified areas such as political, international, national, and regional issues, sports, health, travel, lifestyle, technology and business. People having similar interets on the above topics will find this page useful. Karthik about worldcup selection and about MS Dhoni | Sports News.